(NASCAR)—A Clash crash for Missouri’s only remaining native NASCAR Cup driver has gotten his 2018 Cup season started poorly. 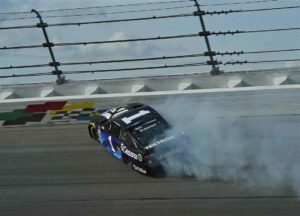 Joplin’s Jamie McMurray hit the wall on the 33rd lap of the 75-lap Clash, and had to drop out ten laps later. 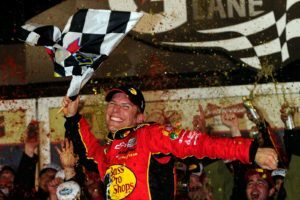 He finished last in the seventeen-car field made up of past winners of the Daytona 500, past pole-sitters for the race, and drivers who made last year’s playoffs. It was the first time drivers have had their new cars with the new rules package on the track under true racing conditions. McMurray’s Ganassi Racing team joined other Chevrolet teams in switching to Camaros this year. Brad Keselowski won the race, leading five cars across the finish line while the remaining eleven competitors wrecked behind him. The crash did not damage the car McMurray will drive in next Sunday’s Daytona 500. He qualified that car 23rd fastest for the race at 192.160 mph. Our adopted Missourian, Clint Bowyer, was sixteenth fastest at 192.893. Neither of those two results will determine their actual starting positions in the big race, however. Only the first two starting positions are set during qualifications and those slots go to Alex Bowman (who inherited Dale Earnhardt Junior’s ride) and Denny Hamlin, both of whom ran qualifying laps topping 195 mph. The rest of the starting positions will be set after the Duels on Thursday. The qualified field is split for two 150-mile races with the odd-numbered position qualifiers racing in the first Duel and the even numbered qualifiers running in the second Duel. Finishing positions in those races determine the starting positions for Sunday’s 500, giving both McMurray and Bowyer chances to improve their starting slots. McMurray and Bowyer finished second in their Duels last year. McMurray starts twelfth in the first duel. Bowyer starts eighth in the second race. McMurray, of course, would prefer a finish next Sunday that is much more like his finish in 2010. He’s been in Daytona’s victory lane twice, once in 2010 and again for the July race in 2007. Bowyer, was fourth behind McMurray in 2010, his best finish in the 500. A crash on the 128th lap last year ended his day early, in 32nd place.